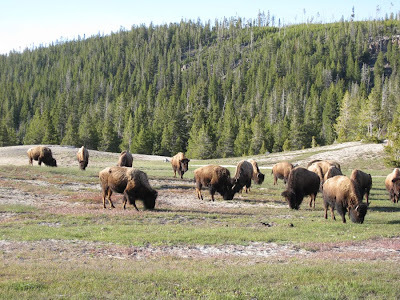 Bison in Yellowstone, the Tetons neighbor to the North. I'm off to wrassle some dogies out in the wilds of Wyomin'. Well, okay, not really, but a girl can pretend a little, no? In reality we are heading to Grand Teton National Park and the Jackson Hole area for some fresh air, nature loving, hiking, rafting, and horseback riding. A lot to fit into a 4-day itinerary! I'll be back in a week to report on all of our adventures. Happy Labor Day and enjoy the week!